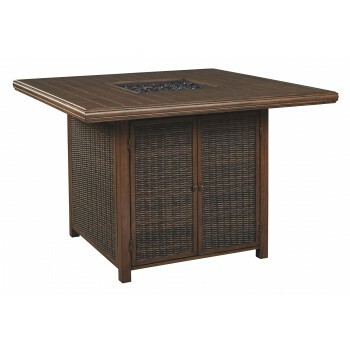 Turn your backyard space into your own piece of paradise with this outdoor table with fire pit. Though this outdoor table looks remarkably like wood, it’s made of sturdy, rust-proof aluminum that’s perfectly suited for al fresco living. Enhancing the rustically refined aesthetic: side panels accented with all-weather, handwoven resin wicker. The result may look high maintenance, but rest assured, this outdoor fire pit table is anything but. With the press of a button, ignite a flickering flame that dances over a bed of glass beads. And with room for up to eight, it’s one highly accommodating outdoor bar table.